Thanks to NetGalley and Vintage Books for the ARC of this book. Warning – this review contains spoilers. William Boyd is one of my absolute favourite authors but I have not read any of Ian Fleming’s James Bond books before. So I was looking forward to reading this book with a bit of trepidation. I wanted to like it because it is William Boyd and it marks his return to Africa, where some of his best books are set; but I was worried it may take an out-dated position on gender politics which would annoy me. Initially Boyd makes a very small attempt to invert Bond’s sexist world outlook by unexpectedly making his African liaison, Blessing, a highly educated woman; however, this is very quickly undermined a few pages later when this beautiful, clever woman half Bond’s age is luring him into her bedroom pretending she is scared of lizards in order to get him into bed. At that point I decided I would just have to go with it. What did I expect from a Bond novel? Strong, brilliant, chaste female characters who were able to resist Bond’s manly charms and be an important player in their own right? No. So I decided I would overlook the book’s gender politics and judge it on other criteria; plot, pacing, writing-style etc. I found the book a bit slow to start with. For example, I really did not need to read about what type of car Bond was test-driving (although I presume this kind of detail is inherited from Fleming’s original stories); I just wanted the plot to get going. However, once Bond arrives in Africa, the pace definitely picks up. Bond has to try to stop a civil war single-handedly and encounters starving villages, battles, creepy soldiers and a fatally ill General along the way. After Bond has completed his mission in Africa, he returns to Britain and determines to get revenge on the baddies who tried to kill him in Africa. (It turns out Blessing wasn’t a pathetic woman who couldn’t resist Bond’s charms, but was actually playing him all along. Good.) He decides that he is going to have to get his revenge as a ‘solo’ off the record mission. I did not understand his reason for this decision. The three people he is after are clearly enemies of the state, MI6 would want them dead too, they have targeted one of its agents; why does it need to be a solo mission? I guess it just makes a more tense and exciting storyline and gives the book its catchy title. Bond’s revenge mission takes him to America where he wanders around a lot, eats food, buys stuff, stakes people out and has a run in with the CIA before we finally reach the climatic shoot out. This is followed by a return to Africa and a guest appearance from Felix Leiter for some long-winded exposition about what has gone before. 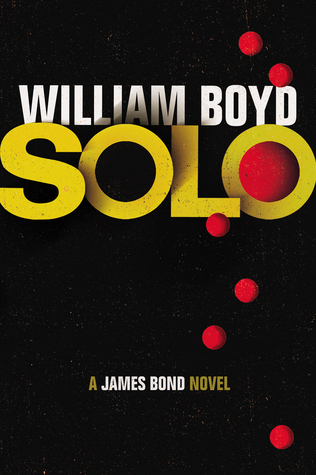 At the end there is some more pointless flirtation with a token beautiful woman who really did not need to be in the story at all before the book finishes with a highly unsatisfying and illogical ending where it seems one of the baddies isn’t dead after all but for some reason we don’t get to see Bond find him and kill him. I’m not sure what to make of this book. It’s an easy read and it wasn’t that I didn’t enjoy it but I think the plot could have been tighter. Boyd could have cut the character of Bryce altogether and started the narrative at the point at which Bond is sent on the mission to Africa. This would have saved the slightly mundane sections at the beginning where all Bond does is flirt and test-drive cars and would have made the story more fast-paced and exciting. Also, there is no need for the inference that Kobus is still alive at the end of the book unless we are going to see Bond give him his comeuppance. This slight cliff-hanger suggests that Boyd is angling to write a sequel where we see this happen. While the plot and pacing could be stronger, the prose is up to Boyd’s usual beautiful standard. I found myself learning new words while reading (‘bibulous’ is one that sticks in my mind), which is always exciting! He writes with meticulous detail and always seems to find the perfect way to describe things. I think I would recommend this book to fans of Boyd and, although I have not read any of Fleming’s original work, I feel this would probably satisfy his fans also. The section of the book set in Africa stands out above the rest of the book, because Boyd is so familiar and passionate about this continent, his writing is always superb when describing scenes set there. I would also recommend ‘Brazzaville Beach’ to anyone who has not read Boyd’s earlier novels set in Africa. It is an intriguing and very enjoyable read and, unlike ‘Solo’, has a fantastic three-dimensional lead heroine.